Engagement through design – How does your intranet design affect workforce engagement? Employee engagement is a topic which I have written about a lot since starting at Invotra, and understandably I’m not the only one writing about it. It has become a prominent topic in today’s business landscape and has become a priority for junior and senior management alike worldwide. However, with 1/3 of workers across 17 of the world’s most prominent economies reporting as being disengaged*, it is clear that this is something easier said than done. So, how can your intranet design impact engagement? Short answer, a lot. Humans are very visual, and a well-designed intranet can allow people to engage with the organisation without having to put the effort in themselves. One of the most important and basic ways that you can improve your design is through colour. Colour has a unique link to our attitudes and emotions and can be a powerful tool in influencing them. There’s a reason we say we are “seeing red” when we are angry, or “feeling blue” when we are sad, and it’s not random coincidence. It is therefore important when designing your intranet to think about the psychological implications of the colours you use. You may decide to use yellow as your primary colour – connoting bright and cheerful – or blacks and greys to connote a sleek, professional mood to your users. Our emotional relationship to colour, however, is influenced a lot by the culture and environment we inhabit and therefore it is paramount to be aware of the different groups within your organisation (such as having offices in other countries, with different emotional reactions to colours). 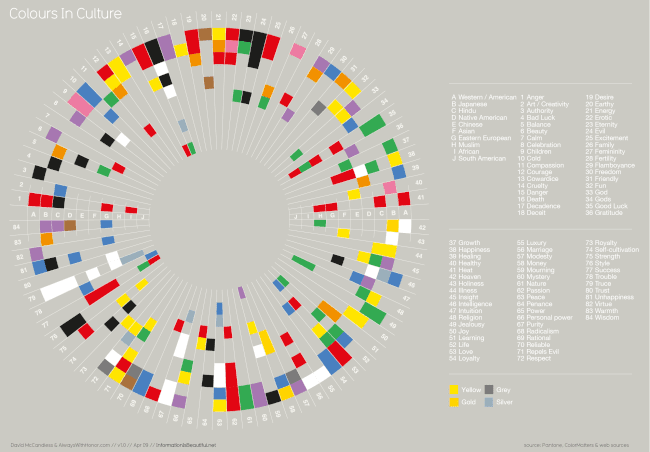 One very interesting tool when looking at this is this colour wheel by informationisbeautiful.net, which breaks down people’s emotional relationships with colours, broken down by different countries. Another way that design can impact your employee’s engagement is through your font. Fonts have built-in personalities, which can impact the way that your users interpret not just the text throughout your intranet, but the intranet as a whole. Your fonts can feel professional, casual, fun or even downright silly, and with this huge array of impacts that fonts can have, it’s important to evaluate your organisation to see what you feel would fit best. For example, this font ‘Youngblood’ is a display font, it is very interesting to look at, and connotes an artisanal, loud tone. However, it is hard to read at length due to its complexity. Whereas ‘Libre Franklin’ (a text font) is far simpler and much easier to read, it has a much more professional, accessible and strong personality, and as such is more suitable for use in a professional context. However, wherever a font is used throughout your intranet, it needs to support your organisation’s brand and messaging. Personalisation is key. Perhaps most importantly, however, when it comes to engaging your employees, comes navigation. Your intranet has to be pleasing for your users to look at yes, but first and foremost it must serve a purpose, and if people can’t find what they need, they will be more likely to stray from the intranet, allowing it to become a dusty background page, only really seen when booting up your browser. In order to make your intranet’s navigation easy-to-use and intuitive (very important factors in usability), you must ensure that content is visible, accessible and the navigation is consistent. People should be able to immediately see what they want to find (or at least, where they can find it) which is where the “Mega-menu” comes into the firing line. Secondly, the content must be accessible, not just in the sense that it is actually there for people to access, but in the sense that it can be found by 100% of your users, regardless of disability. Large, convoluted drop-down menus are a nightmare for screen-readers, and if the text within the menu doesn’t have enough of a colour contrast (Click here to be taken to an online colour contrast checker), it can become incredibly difficult for your hard of sight users to read. Finally, comes consistency, you shouldn’t be using different menus throughout different pages unless you absolutely have to, and an untrained user should be able to find content without having to figure out different menus for each site-section. This consistency builds familiarity, and from this, your intranet becomes intuitive to use (a goal for any navigation system). If your users can find what they want to without having to endure arduous treks through menus and submenus then they will inherently become more inclined to utilise the intranet, therefore increasing engagement. Design can have huge implications for your intranet’s ability to engage your workforce, and in order to be successful, it must be able to replace the non-verbal communications we rely on so much in everyday life. If you want to learn more about Invotra’s flexible design capabilities, click here.